Bunnahabhain is not a heavily peated malt – it embodies the more gentle side of Islay, making it an approachable dram. The nose is fresh and aromatic, and the palate is light with fruit and nuts, pairing wonderfully with ‘Islay Angels' – oysters and smoked cheese wrapped in bacon, a lovely canapé or starter. Small batch distilled. Natural colour un-chill filtered. 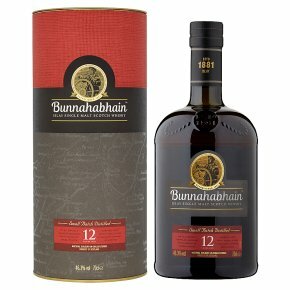 An alluring complex bouquet with aroma of dried fruits toasted nuts with vanilla and a delicate coastal influence Russet gold, this is a complex 12 Year Old with hidden depths. Aromatic fruity floral scents with the most subtle hints of smoke prepare the palate for sweet fruit and nuts with a vanilla and caramel finale. Andrew Brown Distillery Manager Tasting Notes Colour: russet gold. Nose: fresh and aromatic, fruity floral with hints of dried fruit and a subtle prevalence of smoke. Palate: light with fruit notes, nutty flavours with a sweetness and slight hints of vanilla and caramel. Finish: lingering, beautifully rich and full bodied.